A typical Russian meal starts with appetizers (zakuski), moves on to a hearty bowl of soup, proceeds to an equally hearty main course, and finishes with a not-too-sweet dessert. Soup is, or traditionally used to be, consumed on a daily basis in Russia, explaining the seemingly endless varieties. Schi, borsch, rassolnik, botvinia, ukha, okroshka, solyanka and many others take pride of place. They can be based on meat, fish, mushroom, vegetables or milk stocks. 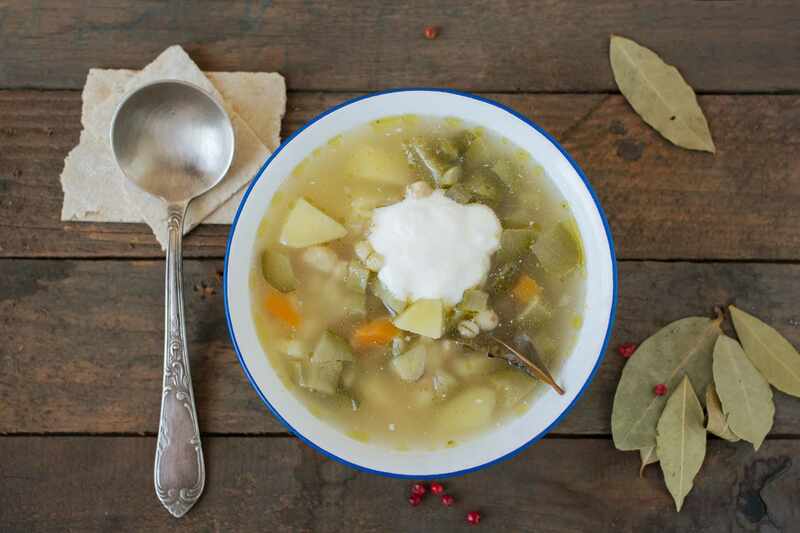 Here are 10 of the most traditional Russian soup recipes. Rassolnik or rassoljnik (rosolnyk in Ukrainian), made with kidneys or giblets and pickles, is known as a hangover cure because rassol, the brining liquid from the pickles, contains vitamins which help the body to hold water and counteract the dehydration produced by over-imbibing, the main cause of hangovers. Fresh cabbage soup or shchi (pronounced shih) is one of the national dishes of Russia. When the soup is made with sauerkraut, it is known as sour shchi or kislye shchi, and when it is made with sorrel, spinach and other greens, it's known as green shchi or zelyoniye shchi. As with most dishes, the recipes vary from cook to cook and from region to region. It can contain meat or be meatless and is often served with boiled potatoes on the side. Many Russian cooks put on a pot of schi in the morning, go about their day, and serve this thick soup for supper. This recipe for Russian beetroot soup or borshch is made with beef, cabbage, carrots, potatoes, onion and beets. Turnips and other root vegetables can be added if desired. Contrary to popular belief, Russians don't spell their beetroot soup borscht (that's a Yiddish spelling) and it's really not a Russian invention (Ukrainians claim it as theirs). Nor are beets the predominant ingredient in Russian borshch. That's probably why this stew-like soup is orange from the carrots and tomato paste, not red. Poles call their beet soup and it has the ruby-red color most people associate with beet soup. Russians call their cold beet soup, which is very red in color, svekoljnik. When it is mixed with sour cream, it takes on a pleasant magenta color and is known as kholodnik and is similar to Polish chłodnik. In Ukraine, beet soup is made in infinite varieties, but some resemble the Russian version and are also called borshch. Solyanka (also spelled soljanka and pronounced sohl-YAHN-kah), which comes from the word for "salt," possibly originated in Ukraine in the 17th century and became popular with Russians. This is a hearty, thick soup with salty cured meats, sausages, olives, capers, pickles, cabbage, sometimes carrots, and dill and sour cream for garnish. Accompanied, of course, by whole-grained bread. There is a vegetarian version but meat solyanka is the most common. It can be considered an "everything-but-the-kitchen-sink" type of soup. There also is a solyanka with fish version. There are as many recipes for traditional Russian fish soup, known as ukha (pronounced OO-khah) or uha, as there are cooks in Russia. It can be made elegantly with a clear fish stock and served with a side of mini fish dumplings known as pelmeni or mini fish pies (). Or it can be very rustic and flavorful as I have done here. This is my adaptation using walleyed pike, but any white-fleshed fish or even salmon can be used. Traditionally, it is made with fish heads and bones as well as different types of fillets. This soup is hearty enough to be eaten as a main course. In Slavic countries, mushroom hunting and preserving them by drying is a national pastime. During the winter and at other times when fresh mushrooms are not available, these dried jewels of the forest are made into soups and sauces. This recipe for vegetarian dried mushroom soup is often served at the meatless Russian Christmas Eve Holy Supper known as sochelnik or sochevnik. This is just one recipe among many Russian mushroom soup recipes, as in this Russian Mushroom-Barley Soup & Cheese Recipe, which is made with a combination of fresh and dried mushrooms. But, in my book, using all dried mushrooms produces the most intense, delicious flavor. This recipe for sorrel soup is known as shchavelya sup in Russian but is usually referred to simply as schav (pronounced skhahv). Sorrel is domesticated and grown wild throughout Eastern Europe and spring is the best time to pick the young, tender leaves. Sorrel finds its way into soups, sauces (especially with salmon), stuffings and, when young and tender, is eaten raw in salads like baby spinach. This recipe is for a Jewish version, often called schav borscht, which can be eaten hot or cold, and is a good candidate for Passover.